Jewellery shopping is not as simple as it seems to be. There are many factors which need to be taken into consideration for the same. And shopping engagement rings is indeed a difficult thing. You will be wearing this ring all throughout your life and thus it should be able to handle the pressure without losing its sheen and appearance. Nowadays many people choose to buy bridal set rings, which is set of engagement ring and wedding ring in one. There is no need to buy the two rings separately. The ring set is prepared in such a way that both the rings set with one another perfectly and look like one ring. The sets are available in varying designs and patterns and you can choose the one you like. 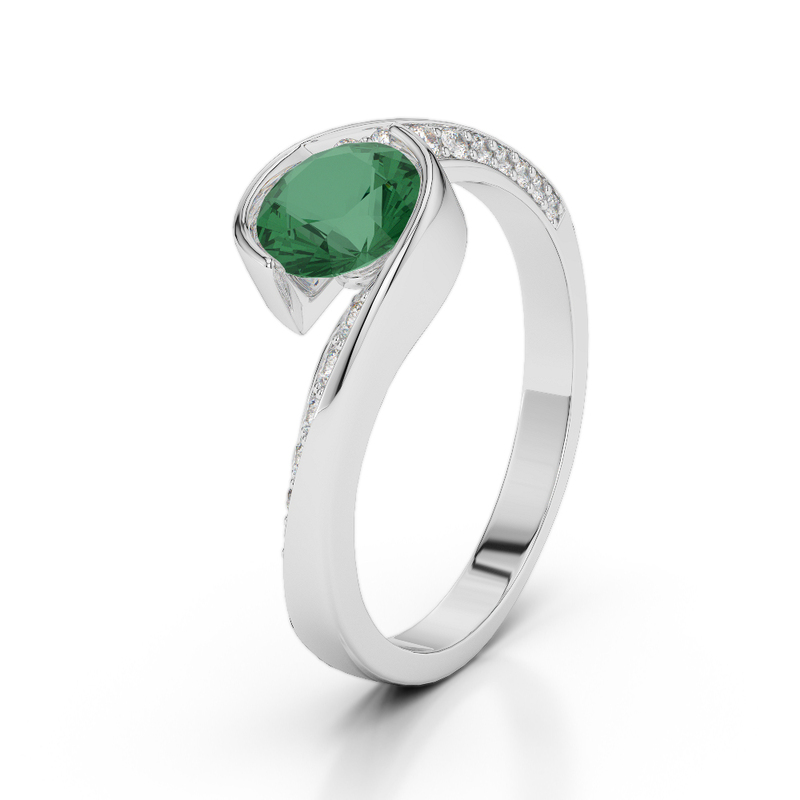 Birthstones are quite popular and many people use the same in their engagement and bridal rings. For instance, emerald is the birthstone for people who are born in the month of May. If your spouse is born in May, you can easily look for emerald rings for her for engagement and for the wedding. 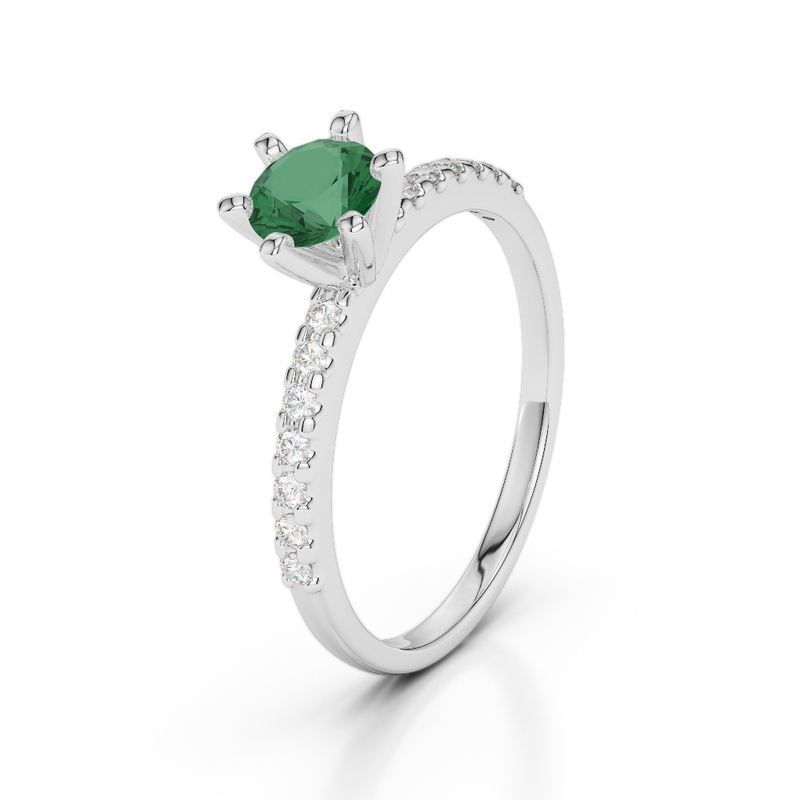 Depending on her choice and preferences, the design and style of the emerald ring should be chosen. This ring has white gold as the base with brilliant round diamonds and the settings is in ‘prong and pave’ style. The small round emerald lies in the center of the ring, surrounded by diamonds. Few diamonds are also set on two sides of the emerald setting. 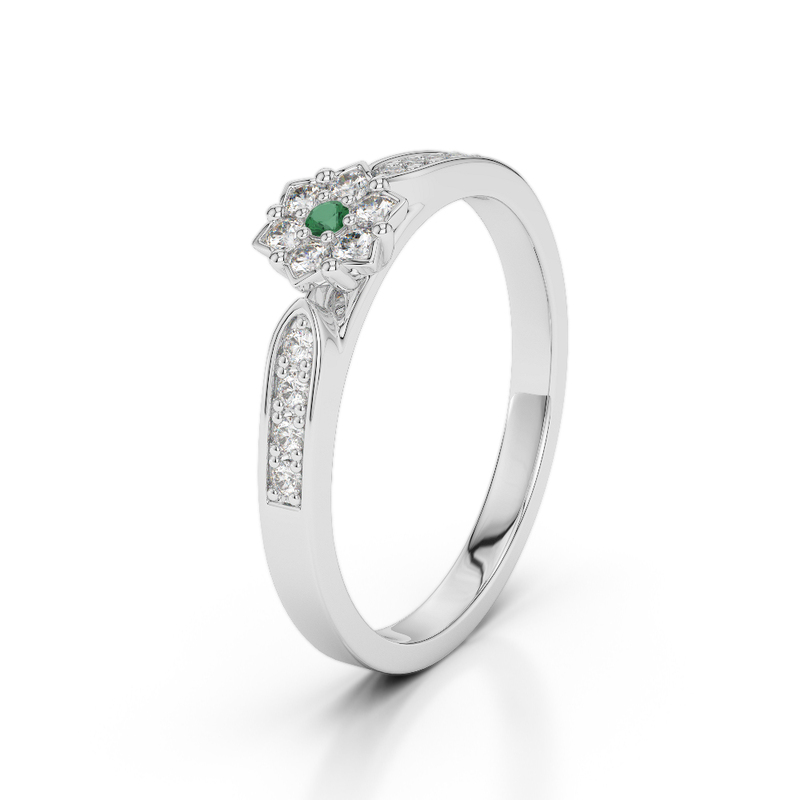 This engagement ring is extremely simple with white gold base and a bigger emerald in the center. There are 4 diamonds sitting on the top of the clamp within which the emerald is set. Simple yet stylish, this ring is comfortable to be worn on daily basis. The setting of diamonds and the emerald in this ring is little different from other rings. The emerald is set right in the center with tight clamps and four pieces of diamonds sitting on top of the clamp. On the sides, diamonds are studded and the sizes of the same keep increasing while going towards the bottom of the ring. This engagement ring has a unique design. The emerald in the center is not very large and there are diamonds studded in there as well. The sides have a quadrilateral design with diamonds studded in the middle. 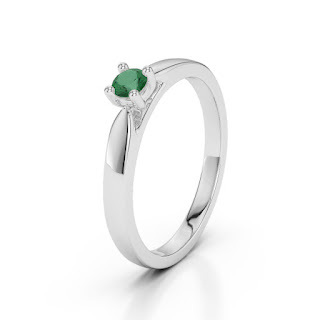 Check out this amazing emerald engagement ring with a lead shape on top. And the leaf-shaped design is studded with diamonds and emerald. Infact the diamond setting comes down from the center to the two sides also to some distance. If you want to gift your spouse an engagement ring which is slightly bold and beautiful, this ring will serve the purpose well. The ring has width of 3.8mm and has two rounds of diamond settings and an emerald setting in the center. This engagement ring is sure to express how much you love your spouse as there are many diamonds studded in the ring, right at the center and at the sides. 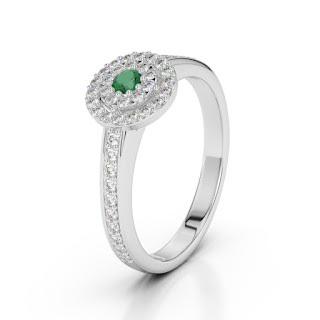 The bold center with the emerald setting surrounded by diamonds is lovely! If you love to do things in a different way than the rest, this engagement ring will surely fascinate you. 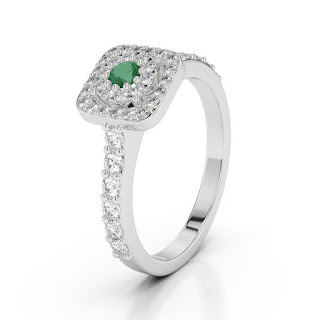 The center square design with diamonds and emerald settings is splendid and so is the side diamond studding. If your spouse loves uniquely designed jewellery, this engagement ring will be sure winner with her. 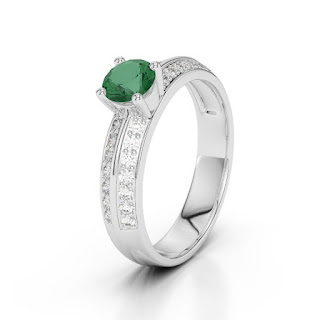 With emerald setting at the center, this ring has amazing design. Few diamonds are also studded on one side of the ring. This engagement ring has six clamps in which the emerald is set. Usually rings have four clamps and this is what makes this ring different. Though the center has only emerald, diamonds are studded on both sides of the ring. Check out the complete collection at AG & Sons.